How Are Hot Tubs Delivered? Posted on December 28, 2017 December 26, 2017 , in Hot Tubs. The purchase of a new hot tub is an exciting time in a home. No doubt, you have done all your research and now your family is eagerly anticipating all the fun times ahead. In the meantime, there are a few things you can do to prepare for the installation. Below, we have listed some helpful information about the delivery process. Clearing a pathway for your hot tub is the best way to start preparing for your new hot tub. Make sure to remove any possible obstruction like overhanging wires, A/C units, awnings, picture frames, or furniture. Also be aware of any possible fencing doors or gates, that can cause difficulty when installing the hot tub. They may need to be temporarily removed until the installation is complete. If you are unable to install your hot tub due to walls, stairways, or tight corners you may need to consider a crane. In preparation for your new hot tub, there is some information you should know before picking out the perfect location. When empty, a hot tub can weigh anywhere from 350 – 1000 pounds. Once filled with water it can weigh over 3,000 pounds, not including the weight of the people using the hot tub. An essential part of this is to make sure your foundation can support that kind of weight. Leveled stone or concrete is typically the best sort of surface to rest your hot tub on. You may need to contact a professional contractor if you are trying to install a hot tub on a deck or patio to ensure that the structure can support the maximum weight of your hot tub. A surrounding structure or gazebo can be added to your hot tub to give it a more luxurious aesthetic. However, you do need to make sure that the structure does not interfere with any of the hot tub components. For example, you need to be able to access the side panel so you can easily access the hot tub’s equipment. Additionally, some areas have municipality codes and building regulations that may interfere with your installation. Make sure there is either a protective fencing or barrier so any children in the area cannot access the hot tub without supervision. Also, you will need to confirm there is an electrical hookup available. There should be an outside electrical disconnect, which is required by many municipality electrical codes. 1. A crane delivery can be a bit more challenging for some, so be sure to have two able-bodied assistants available to help you install your hot tub. 2. Obstacles can interfere with a timely installation so double check for any furniture, BBQ’s, flower boxes or lawn ornaments that may create issues during installation. 3. Have an electrician scheduled to be on-site at the electrical hook-up. 4. So you do not have to wait too long to enjoy your hot tub, have a hose and water supply ready to fill the hot tub. 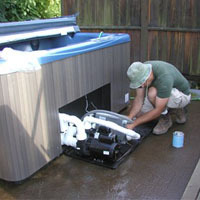 After filling your installed hot tub with water, there are a few things you need to be sure to do. First, make sure to add the proper balancing chemicals to the water. Second, allow the hot tub time to warm up the water to your ideal temperature. While you patiently wait, you can spend time reviewing the owner’s manual so that you will be ready to set the temperature, spot any filtration cycle error, and turn on the massage jets. Those with children should take extra caution and speak with their kids about the safety rules regarding the new hot tub. After completing all these steps you are ready to enjoy! Download a hot tub buyer’s guide to learn about the many different features and models available.